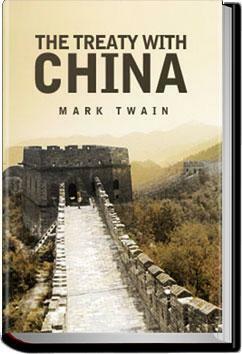 "A good candidate for 'the most under-appreciated work by Mark Twain' would be 'The Treaty With China,' . This piece, which is an early statement of Twain's opposition to imperialism and which conveys his vision of how the U.S. ought to behave on the global stage, has not been reprinted since its original publication until now." . . .Chinese protection of American ships against such outrages. ARTICLE 2. The United States of America and His Majesty the Emperor of China, believing that the safety and prosperity of commerce will thereby best be promoted, agree that any privilege or immunity in respect to trade or navigation within the Chinese dominions which may not have been stipulated for by treaty, shall be subject to the discretion of the Chinese Government, and may be regulated by it accordingly, but not in a manner or spirit incompatible with the treaty stipulations of the parties. Twain's droll humor is such that sometimes I find myself wondering if he was serious or really kidding. His take on our treaty and relations with China and "Chinamen" was ahead of his time obviously.